12 Truths about Backyard Chickens. They're sweet. They're fluffy. Their little “peeps” will quickly steal your heart. 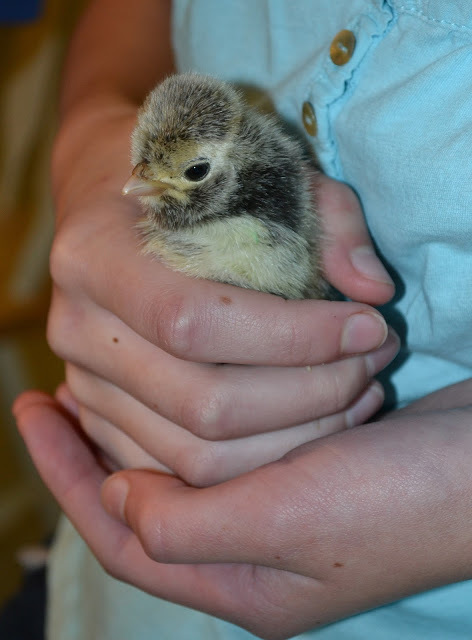 Honestly, how can you not become enamored with cutie-patootie little chicks, especially when they will ultimately provide fresh eggs for frittatas? Two years ago, we took the leap and joined the backyard chicken craze, which you can read about here. 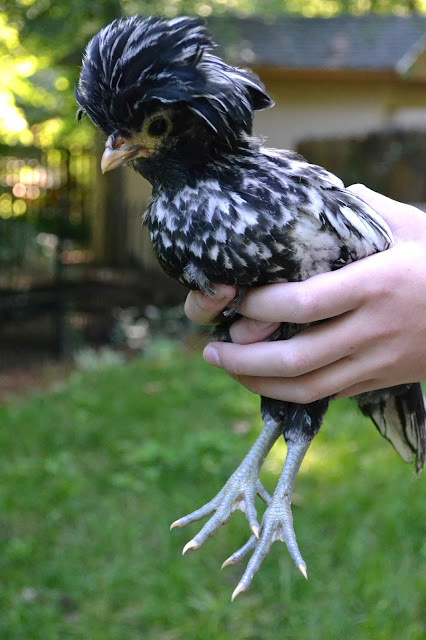 In May, we welcomed our latest chicks: Tinkerbell (Buff Laced Polish), Sprite (White Crested Blue Polish), Willow Wisp (Blue Andalusian), and Pixie (Silver Laced Polish). Everything went well with the newest chicks. They grew, they thrived, the kids became smitten with their newest pets. Even integrating the new girls into the existing flock went fairly smoothly. When we began our chicken adventure, we knew the odds. Although we ordered pullets—female chicks—the hatcheries very carefully explain on their websites that sexing is not an exact science. In fact, there's a 10% chance that your order will contain a rooster. Every year since our adventure began, I've warned the kids that if one of the chicks falls into that 10% error-margin, we cannot keep a rooster. Each year, we've held our breaths—and we've been lucky. “Third time's a charm” apparently didn't apply to our third flock of chicks. Truthfully, we knew before Pixie announced it. While Polish possess an unmistakable “hairdo,” Pixie's plumage appeared significantly different than his sisters' feathers as he grew. Kristen suspected Pixie's “roo-ness” before he ever uttered his practice crow. 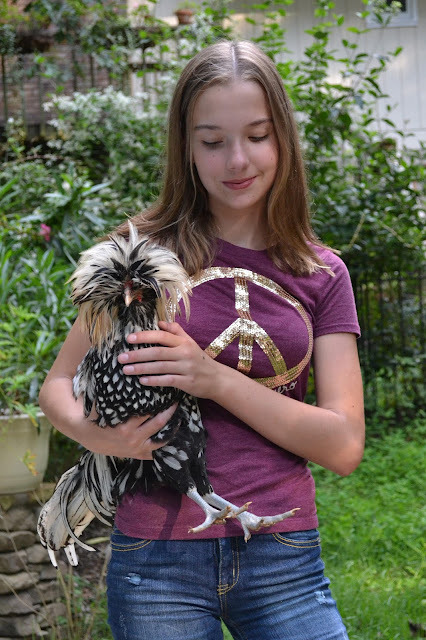 As I searched the Internet, images of young Polish roosters appeared that looked just like Pixie. When I cautioned the kids that Pixie would need to leave if and when he began to crow, they began researching ideas about how we could keep him. Kristen, my animal lover, even researched surgery for roosters to remove their crow. My sweet, animal crazy girl lost all reason. She also plotted to paint his nails pink, put a bow in his feathers, keep him inside the coop so the neighbors wouldn't hear his crow, and basically LIE to anyone who asked if we owned a rooster. I must admit, I actually thought of a few of those ideas, too. But we parents must set aside our own emotions and help our kids make good decisions. We weren't going to subject Pixie to potentially fatal surgery, embarrassing hair-bows, or pink nail polish. Instead, I reminded the kids that if we were inconsiderate neighbors, the entire flock could be at risk. Who knew what could happen if a neighbor complained? Instead of finding a new home for Pixie, we could potentially lose all of the girls. It was a fine parenting moment. So, when I heard Pixie's first crowing attempt, my chest tightened. The second attempt was also rather pitiful—but unmistakable. The third time sounded almost like a real rooster. It was time to make a plan. Truthfully, it was past time to make a plan. The plan for Pixie's theoretical home should have been in place BEFORE we added chicks to our home. After all, we're not the only people who try to re-home a rooster. 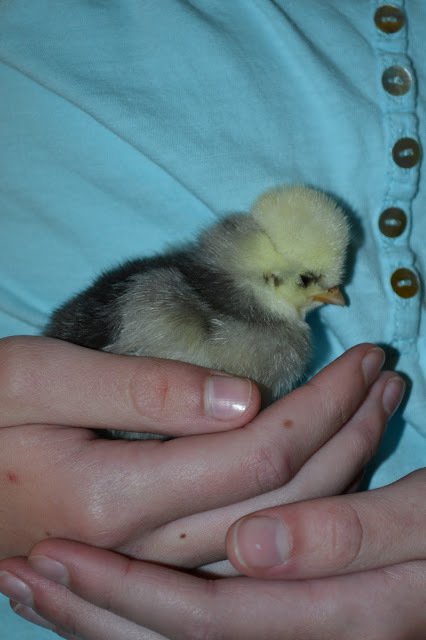 I remember reading Theresa's account of re-homing her rooster on her blog, Living Homegrown. I even sent her a sympathetic message, praying that we'd never be in the same boat. Silly me. In the excitement and emotion of selecting chicks, most of us never really properly plan. Although Kristen read more than a dozen books about chickens, we attended a seminar about raising chickens, and I spoke with several farmer friends, we learned some things the hard way. I hope you can benefit from our experiences. 1. Tiny Chicks = Big Chickens. Those cute little fluff balls at the feed and seed store will grow into large eating and pooping machines. Do you have the time and space to provide a good home for them? A Rubbermaid container in your house might hold chicks for awhile, but then what? Did you check with your Homeowners' Association, city, or neighbors to make certain chickens are allowed? Check your local ordinances before those cute fluff balls follow you home. 2. Cute Coops vs. Safe Chickens The adorable coops you've pinned on Pinterest or that you plan to order online may be darling, but will they keep out predators? Our first precious little coop that I bought online was guaranteed “raccoon-proof.” And yet, a raccoon opened two sliding latches and killed Saltine. It was horrible. Granted, our chickens are pets, so we all took it very hard. Our new Chicken Fortress is like Fort Knox for chickens. Peter constructed it from scratch, and the door handle/lock requires two hands to open it by turning the latch down. We've yet to cute-ify it—it's not Pinterest worthy. Yet. But our girls are safe, and that's what matters. 4. Gardening with Chickens = Hungry You. Chickens will eat your garden. It's an urban legend that chickens and lettuce will coexist. I assure you, the minute we let the girls out into the forest to free-range, they head straight for the kitchen garden, while I fuss and yell and tell them to stop eating the chard. They don't listen to me. However, they do eat the bugs in your garden. They're also great mulch movers. If you let them play in your garden, I can assure you that they will do a fine job of removing all of the mulch surrounding your plants. 5. Chickens Are Not Penguins. Chickens fly. Yes, I know you think they don't—but they do. Not all breeds are flighty. Silkies tend to be land lovers. But boy—do your research. Just ask our neighbors, who knocked on the door one Saturday morning to inform us that our two Golden Campines, Sugar and Spice, had joined their yard sale. Mortifying. By the way, clipping a wing does not necessarily cure flighty birds. We clipped one wing on each of our Campines, as recommended, but they quickly regained their balance and continued cruising the air. If you don't have an enclosed run, research the flightiness of the breeds you want to raise before your pick up your chicks. And install bird netting to keep them contained. 6. Picky Chickies. Some breeds like warm climates, some prefer cool. Research, research, research, and then select which breeds are appropriate for your climate. Regardless, always watch the temperature to keep your flock healthy. Provide good shelter and insulation in the winter, and keep the girls cool in the summer. 7. Mission: Impossible. Covert chickening keeping is impossible. If your HOA doesn't allow backyard chickens, please don't assume that you can sneakily raise them. Have you ever heard the proud announcement a chicken makes when she lays an egg? It's loud. While it's not as annoying as our neighbor's hound dog that brays for hours, it's an unmistakable sound. Plus, sometimes they like to cheer each other on as the egg laying progresses. Trust me. I've done the walk of shame to the school bus stop on many occasions, pretending that I don't hear our girls' raucous party. Oh. Ditto for covert roosters. Just don't try it. You'll get an ulcer. 8. Don't Quit Your Day Job. You will not get rich selling eggs. 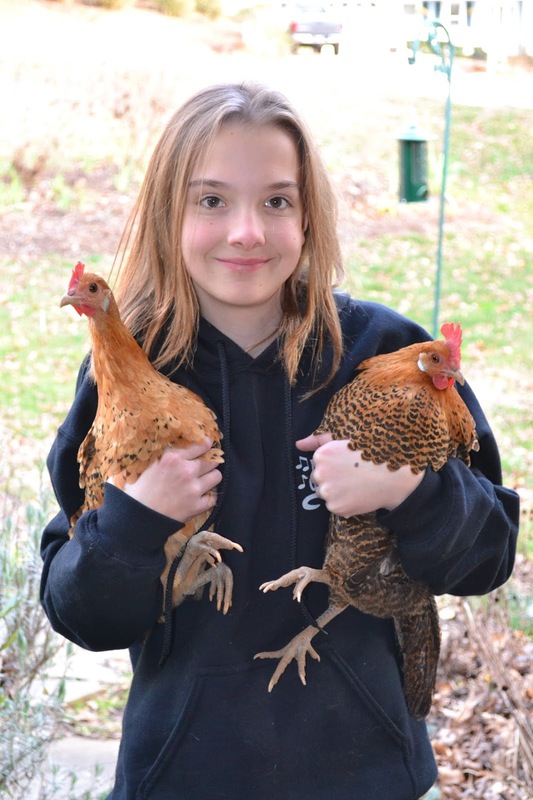 And if you think that raising chickens will be an excellent lesson in entrepreneurship for your pre-teen daughter, just realize that she will never, ever approach anyone to ask if they'd like to buy eggs because she is too shy. (Just my experience.) Friends will offer to buy eggs, but usually you'll give them away to neighbors to keep the peace when chickens show up at their yard sales. There IS a good market for free-range, organic eggs, but will your 6 backyard hens provide enough eggs for you to sell at the Farmers' Market? No, they won't. You will, however, enjoy delicious eggs with deep, orange-yellow yolks. Now, that's rich. Also, you will most likely buy eggs in the winter. Or when your girls molt. Or when they get stressed. As daylight shortens, hens' egg laying slows—and even stops. Yes, you can provide supplemental light to make them continue laying, or you can let their bodies takes a much needed rest, as nature intended. Studies have shown that the supplemental light can decrease the number of years a hen lays. 9. How Organic Are Your Eggs? We all want organic eggs, but organic chicken feed is tricky to find, plus it's pricey. Our local feed and seed doesn't carry organic feed, and I haven't found it anywhere in our area. A permaculture group I belong to is working to find a supplier, but until then, our girls get Layena, plus organic fruit, veggies, and free-range goodies. I'll always prefer our eggs over organic store-bought eggs any day, because I know we have happy, healthy hens. 10. There are no chicken-friendly hotels. (If you find one, please let me know.) Leaving for a quick weekend get-away just got a little trickier. While it's pretty easy to ask a friend or pet sitting service to check in on your pooches, not many people are as enamored with chicken-sitting. Really, it's not difficult, it's just...different. If you find a friend who will watch your chickens, you've found a true friend. Make sure to bring your friend a present from your trip—and, of course, reward your chicken-sitter with some eggs. 11. Chicken Retirement. Chickens typically lay well for about 3-5 years. Then what? What's your exit strategy? They can live another 5, 10, even 15 years. It's important to have a plan. Our girls will have their home here always, and when they stop laying—they'll live out their old age being our pampered pets, just as they are now. But what will you do? Will your chickens be pets, or will they become dinner? It's not easy to find homes for your non-laying chickens. There's no such thing as a chicken retirement home, so make certain you have an exit strategy. Roosters happen. What will you do? We were VERY lucky. A woman that works for Peter raises chickens on her land in the country, and she's just as crazy about them as Kristen. After checking into several issues (are there other roosters that might attack Pixie? Will he be inside at night? How safe is the coop? ), we all agreed that Sandy's farm would be the perfect place for Pixie. Plus, lucky Pixie—he has 50 ladies to woo! Off he went to live with Sandy. The kids were thrilled, knowing that they could visit Pixie and get updates on him. I'm thrilled, because I can finally go outside again, without fear of being accosted by our neighbors. Peter is thrilled, because I've stopped stressing and obsessing about what we should do with a rooster. And apparently, Pixie is thrilled, because he's enamored with a black bantam lady-friend. Go, Pixie! But we were lucky. Do you know a farmer? Have you asked that friend with land if he would be willing to take in a rooster, should you fall into the 10%? I can assure you, there aren't many people willing to take in a rooster. Kristen's horseback riding trainer laughed at me when I asked, then realized I was serious. She suddenly found a stall to muck out. So please, for your sanity, for your kids' emotional well-being, for the health and safety of your new fluffy babies--make a plan. 13. OK, It's a Baker's Dozen of Truths. Even with the raccoons, the roosters, and the escape artists, chickens ARE fabulous. 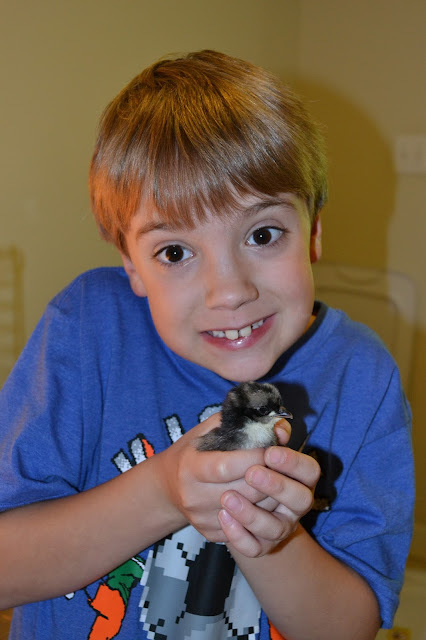 Our kids learn the responsibility of caring for their pets, rarely griping when they tend chickens before breakfast. With backyard chickens, you can cancel your cable, because there's nothing as entertaining on TV. We spend a lot of time amusing ourselves, laughing at our silly girls. We love our chickens, and we thought we were well prepared. But raising chickens is a constant learning process. The chicken blogs, Facebook pages, and magazines sometimes sugar-coat the reality of chicken-owning. Cute coops, fluffy chicks, funny pictures, they're all lovely. And it IS fun. But like with any living animal, you need to be prepared. You might just find yourself in the 10%.